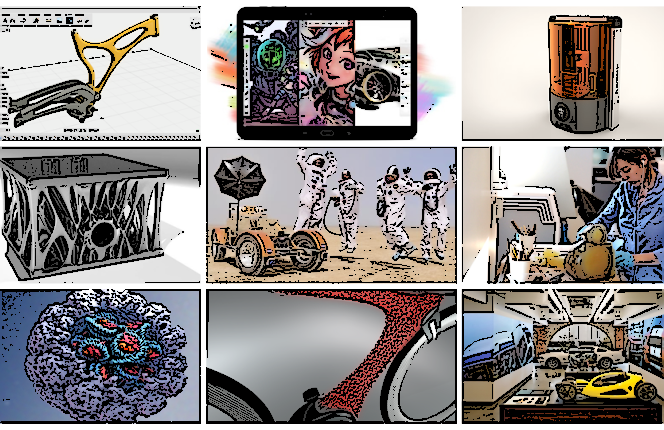 The POV Dispatch is our Autodesk internal newsletter, published monthly, where we discuss the big ideas that are important to us and our customers. It is published by our Corporate Strategy & Engagement (CSE) team of which Autodesk Labs is a part. Jon Pittman is the VP of Corporate Strategy and leader of CSE, so it should come as no surprise that Jon routinely makes submissions to issues of the POV Dispatch. Jon has also been a Lecturer at the Haas School of Business of the University of California at Berkeley. Jon contributed this article to a recent issue, and it was popular among employees. This was a pre-cursor to our presentation at the Leadership Forum at Autodesk University in Las Vegas. 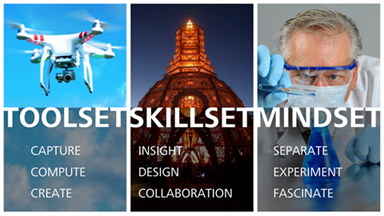 Mindsets — the ability to create competitive separation, conduct valuable experiments, and ultimately, fascinate. Our perspective is that all three of these are necessary, and that they are acquired with increasing difficulty. Toolsets are easy to acquire: you only have to pay mere money for a subscription. Skillsets are a little harder to acquire, because they require something more valuable than money — time. Finally, mindsets are the most precious of these three — they don't require time or money, but they do require something that is difficult for many to do — changing your mind and looking at the world differently. It is relatively easy to describe this perspective, and when we talk with customers about this, they tend to "get it." Many are looking for a "playbook" for innovation, and our framework provides that. This framework is necessary but not sufficient. 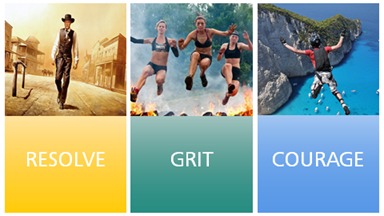 One other ingredient necessary for innovation is character — specifically, resolve, grit, and courage. Innovation is hard work, and real, breakthrough innovation requires going beyond the orthodox view and, in fact, challenging it. This is not easy to do, and it requires the courage of one's convictions. It requires character. Character is a human trait and that brings us the final — and most essential ingredient for innovation — people . Ultimately innovation depends on people, and their character. 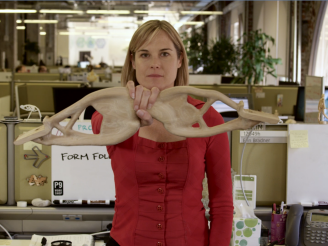 We are privileged at Autodesk to work with extraordinary people. That seems like a trite statement, but I think one of the defining characteristics of Autodesk as a company is our ability to attract and retain curious, courageous, and creative people. I actually believe Autodesk is different from many companies in this respect. To help our customers understand the character (and the characters) behind innovation, this year at the AU Leadership Forum, we illustrated the essential elements of innovation with three people who are behind some true innovations. While their work, per se, is important, what is even more important is the character they each demonstrate as they help Autodesk innovate. One of the skillsets we describe is insight — the ability to see beyond the obvious to understand customers' real problems and challenges. Insight comes from observation — and not just casual observation. Erin is a user researcher with a B.S. in Cognitive Psychology and a PhD in Computer and Information Sciences. She has made a career of systematically observing people and creating insight from those observations. One of the mindsets we describe is to fascinate — to go beyond what you know, and seek out, and ideally create, novelty. One of the challenges in doing that is making sense of what you find, and distilling what matters. Lisa worked with us as an intern on the Primordial project. We teamed her up with a big thinker — Mickey McManus, and they made a great team. Lisa was able to work with Mickey's big ideas to distill and structure them. They each brought a unique perspective to the table and accomplished more together than either could alone. Another mindset is to experiment. To innovate is to try something new; something that, by definition, has not been done before. 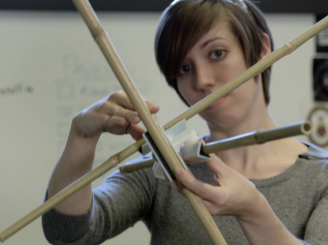 Heather is part of a team that we challenged to so something which might not succeed — to figure out how to design and create a pavilion with a unique combination of people and robots — in a way that neither species could accomplish on its own. 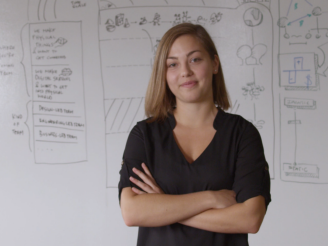 Heather came from an engineering background, where the answers are often known; but for this project, she and her team had to launch into the unknown, and experiment their way to success. They had to fail a lot to learn, and to eventually progress toward a solution. When I look at these three individuals, one thing is striking: in each case, one of the defining elements of their character is that they accomplished innovation, not as lone geniuses, but as collaborators, working with others. While the popular mythology surrounding innovation often celebrates the lone genius coming up with the idea — that is not usually how it really happens. The idea is just the start — getting it implemented is the really hard part. These three innovators demonstrate that accomplishing innovation is actually the product of people working together; not the individual genius, but people who can work with others to create magic. Character is alive in the lab.